I continue to search for new ways to show case merchandise in front of the store. The weather was beautiful today, so I try something new. 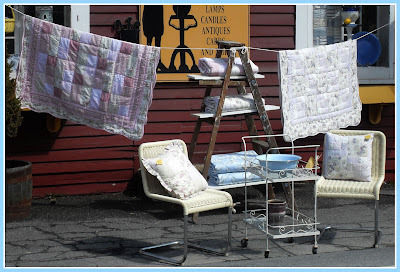 I displayed the new Spring quilted throws, by using a ladder and clothesline. It seemed to attract customers all day! We have five new styles of quilted throws. They are all ten dollars off this week-end making them only $29.95! A few even have matching pillows. Be sure to stop by. Love the quilts! I will have to remember this the next nice day we have! Rain and thunderstorms today! YUCK! But then when I got home...I had a present on my front porch!! WOOHOO! I love it all thank you! !